Tight quarters, awkward loads and heavy machinery - Help warehouse workers work safely. 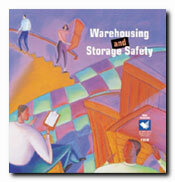 The unique conditions of warehouse and storage work need special safety training. Especially designed for facilities where goods are received, stored or shipped, this kit covers important warehouse safety issues such as forklift operations, material handling, conveyor systems, dock levelers, protective clothing and equipment. Also included are pages with defensive driving tips for delivery drivers. Fire Extinguishers: Which One Should You Choose? Just How Far Does Honesty Go at Work?